I wish I could hug her tight and take all her pain away, but the reality is - the shelter does not tolerate broken hearts and they want her gone! I am so sorry :( NOT RESERVED HAYLIE WILL BE KILLED SHORTLY. It only takes one person to save her and yes foster that is you for a rescue can not pull without you so please step up for this angel she only has you to help her, calling all angel warriors please share thank you. HAYLIE is adorable! Please SHARE, she's SO precious She need a FOSTER or ADOPTER NOW. Thanks! 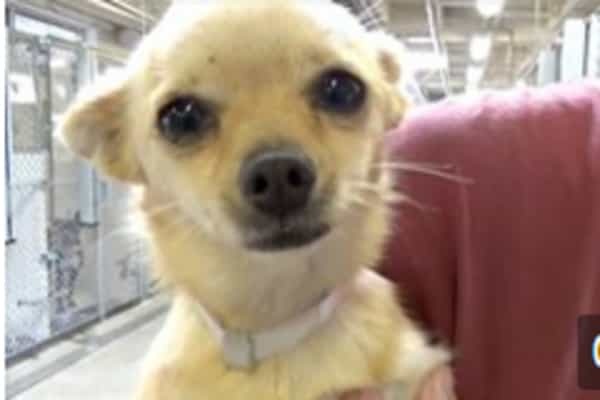 #A5119678 My name is HAYLIE and I'm an approximately 8 month old female Chihuahua. I am not yet spayed. I will be available on 10/14. You can visit me at my temporary home at C236. 13 Responses to "Haylie 8 months old Chi with zero interest, hopeless as she is formally placed on death row"
Want to ADOPY her. Will make arangements to get her to N.C. Please let me know how to Adopt her or who to contact. If local shelter tell me what I need to give them. Let me know update!! I will adopt her!! CALL THE SHELTER IF YOU ARE SERIOUS, DON'T WAIT AROUND FOR AN UPDATE, AND THEN GET UPSET WHEN TYHEY KILL HER! THE NUMBERS HAVE BEEN POSTED MANY TIMES ALREADY! If a serious interest in Adopting please call the shelter right away and begin the adoption process. An application will need to be filled out. There are several rescues and pullers if you are from out oof the area. If you have another dog/pets perhaps a meet'n'greet can be set up. The important thing is if you are seriously interested please contact the shelter right away and begin the application process. Let them know there is a real interest and perhaps give her, and you time. Has Chi been adopted yet?